Saints of Steel was born to give new beginnings to the people who need it most. We believe that everyone deserves a fresh start. That a single moment can transform how you feel on the inside and offer just enough confidence to empower people to pursue a new beginning. Our goal is to transform lives. 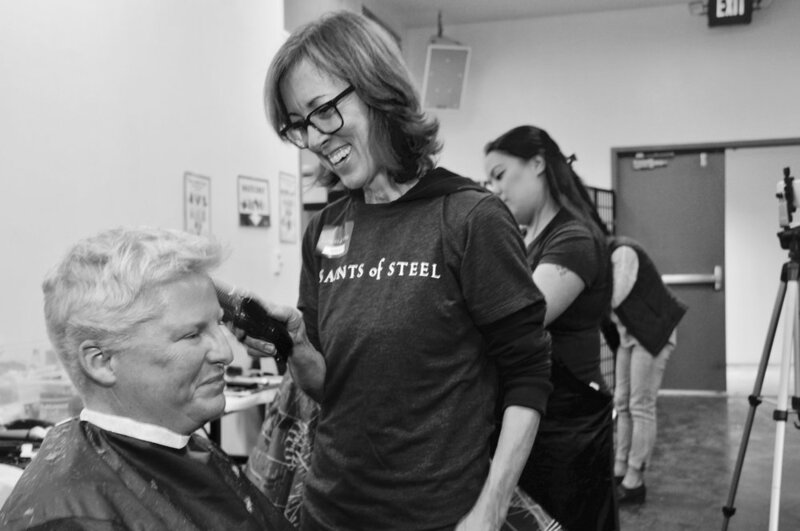 Saints of Steel customizes makeover events for people in need leading them to employment, safe & stable housing & new beginnings. Each detail is designed with the individual’s goals and needs in mind, from the timing of the event to the event elements we provide. Our team is handpicked and trained to meet the unique needs of every moment. lovers of humanity that come together from cities across the U.S. to make new beginnings happen for those that need it most. Is my monthly donation secure? Yes it is. Donorbox uses Stripe's secure token mechanism to keep your information secure. The transmission between the donors, the Donorbox form, and Stripe is encrypted using 256bit SSL/TLS. Stripe is one of the most secure and trusted payment providers. Is my monthly donation tax deductible? Yes. Saints of Steel (EIN 81-4080446) is a 501(c)3 tax exempt organization. All donations are tax deductible. Yes you do. The processing company we use, Donorbox, sends automated donation receipts to you. How do I see where my monthly donation goes to? As a member of the Legion of Saints, you’ll receive quarterly updates on the transformations your monthly gift supports. Yes, you can cancel or make edits to your monthly gifts at anytime. Click here for more info. Can a business join the Legion of Saints? Yes! There’s an opportunity to enter your company name during sign up and monthly donations remain tax deductible. Not to mention a great way to show support for your community by making it better. Can my monthly gifts be supported by company matching programs? Absolutely, 100% the best idea ever! During sign up there’s an option to enter the name of the company that you work for during the donation checkout. Afterwards, you’re presented with your employer's matching procedure. What if I’m not ready to become a member? That’s okay, you can get to know us more by volunteering and/or showing your support by making a one time donation here. Have you always wanted to give back but don't know where to start? If you enjoy talking to people, designing experiences, creating things with your hands or even on your computer we definitely can help you share those skills to better your community. The journey begins here. Know a barber, hairstylist, make up artist, stylist, photographer or creative? These amazing heroes have the power to transform someone’s life. Make an introduction + we'll take it from there. Think we'd make great partners with a nonprofit or brand?